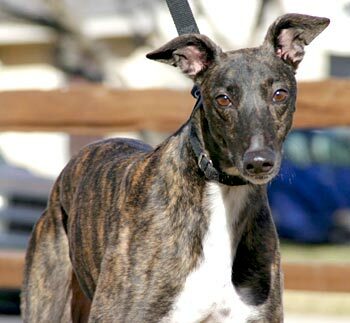 Sweetie, aka RZ Sweet Thing, is a strikingly beautiful 3½-year-old dark brindle female, born May 1, 2004. Her sire is Craigie Whistler, making her grand sure Molotov, and her dam is Rooftop Pinny. Sweetie is a sibling to Custer, and she carries the deep white tuxedo throat trademark of her grand sire, Molotov. 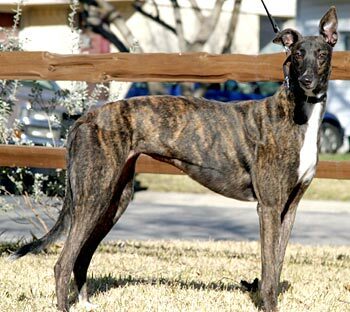 Sweetie's racing career consists of 47 races, starting January 7, 2007, at Corpus Christi, and finishing on August 31, 2007. She lives up to every bit of her name! 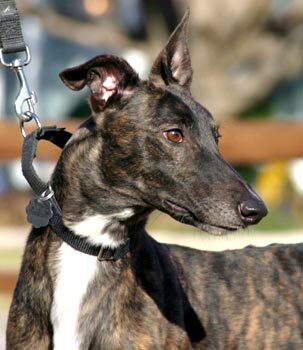 Sweetie lives in a foster home with two Greyhounds a cat and two small dogs and gets along fine with all of her housemates.